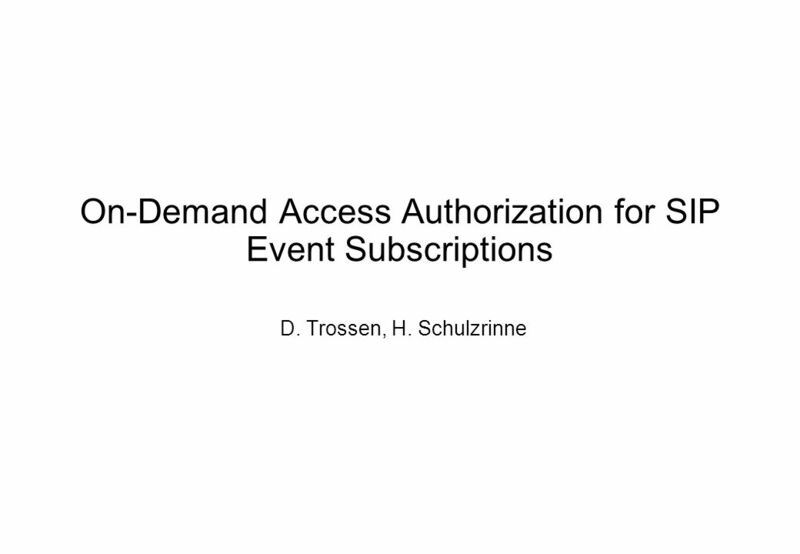 On-Demand Access Authorization for SIP Event Subscriptions D. Trossen, H. Schulzrinne. 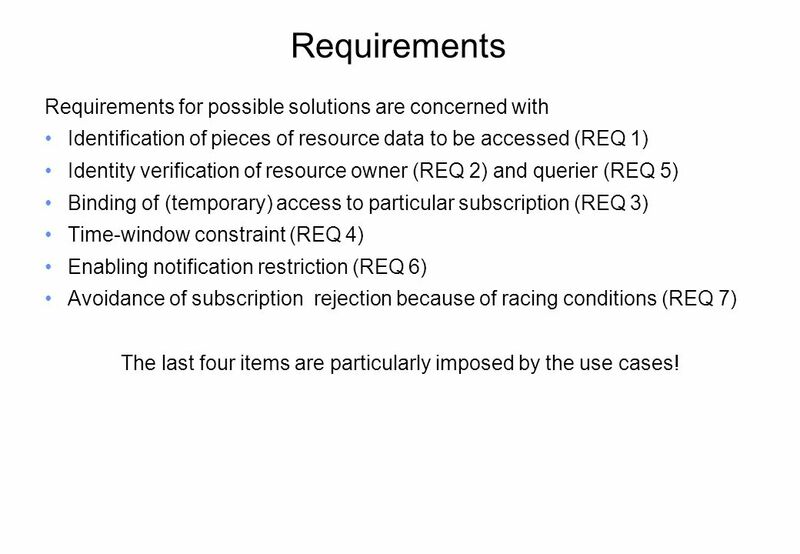 3 Requirements Requirements for possible solutions are concerned with Identification of pieces of resource data to be accessed (REQ 1) Identity verification of resource owner (REQ 2) and querier (REQ 5) Binding of (temporary) access to particular subscription (REQ 3) Time-window constraint (REQ 4) Enabling notification restriction (REQ 6) Avoidance of subscription rejection because of racing conditions (REQ 7) The last four items are particularly imposed by the use cases! 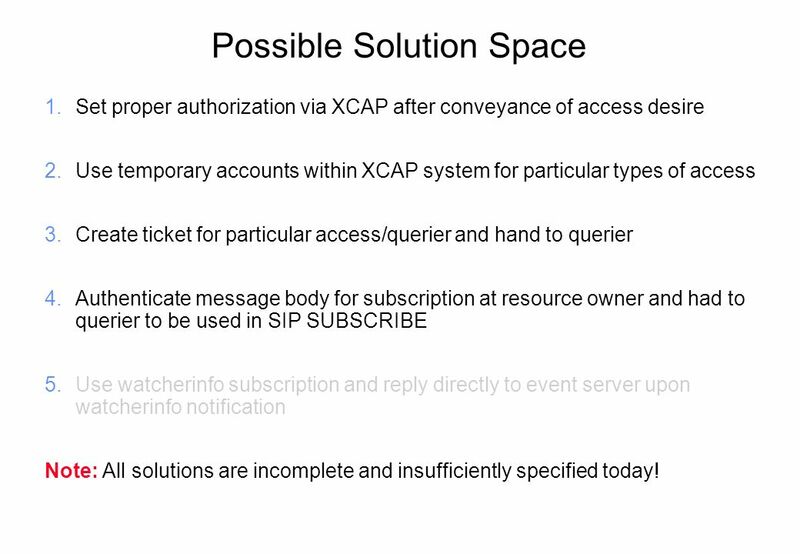 4 Possible Solution Space 1.Set proper authorization via XCAP after conveyance of access desire 2.Use temporary accounts within XCAP system for particular types of access 3.Create ticket for particular access/querier and hand to querier 4.Authenticate message body for subscription at resource owner and had to querier to be used in SIP SUBSCRIBE 5.Use watcherinfo subscription and reply directly to event server upon watcherinfo notification Note: All solutions are incomplete and insufficiently specified today! 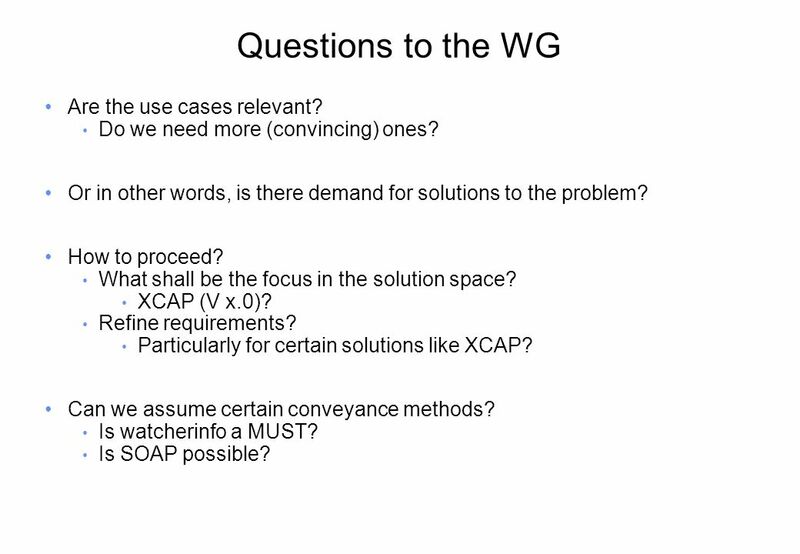 5 Questions to the WG Are the use cases relevant? Do we need more (convincing) ones? Or in other words, is there demand for solutions to the problem? How to proceed? What shall be the focus in the solution space? XCAP (V x.0)? Refine requirements? Particularly for certain solutions like XCAP? Can we assume certain conveyance methods? Is watcherinfo a MUST? Is SOAP possible? Download ppt "On-Demand Access Authorization for SIP Event Subscriptions D. Trossen, H. Schulzrinne." SIMPLE Open Issues Jonathan Rosenberg dynamicsoft IETF 52. AAA Architecture Use of a AAA Server Application Specification to Support Generic AAA Applications Across a Mesh of Interconnected AAA Servers With Policy. © 2006 Open Grid Forum OGSA Profiles Interoperability Testing Dr. David Snelling Fujitsu Laboratories of Europe. Windows 2000 Security --Kerberos COSC513 Project Sihua Xu June 13, 2014. EAP Channel Bindings Charles Clancy Katrin Hoeper IETF 76 Hiroshima, Japan November 08-13, 2009. McGraw-Hill/Irwin © 2004 by The McGraw-Hill Companies, Inc. All rights reserved. Web Services Ellen Pearlman Eileen Mullin Programming the Web Using XML. © 2003 Open Mobile Alliance Ltd. All Rights Reserved. Used with the permission of the Open Mobile Alliance Ltd. under the terms as stated in this document. Sharmistha Chatterjee 82349D 82349D Helsinki University of Technology Instant Messaging and Presence with SIP. 9,825,461,087,64 10,91 6,00 0,00 8,00 SIP Identity Usage in Enterprise Scenarios IETF #64 Vancouver, 11/2005 draft-fries-sipping-identity-enterprise-scenario-01.txt. Doc. : IEEE /0408r0 Submission March 2004 Colin Blanchard, BTSlide 1 3GPP WLAN Interworking Security Colin Blanchard British Telecommunications. Copyright B. Wilkinson, This material is the property of Professor Barry Wilkinson (UNC-Charlotte) and is for the sole and exclusive use of the students. Identity, Spheres and Privacy Rules Henning Schulzrinne (with Hannes Tschofenig and Richard Barnes) Workshop on Identity, Information and Context October. A Heterogeneous Network Access Service based on PERMIS and SAML Gabriel López Millán University of Murcia EuroPKI Workshop 2005.